Our free range Bronze turkeys, fully outdoor bred and reared, are from our poultry farmer Stuart Perkins on the picturesque Castlemead Farm in Radstock, Somerset. 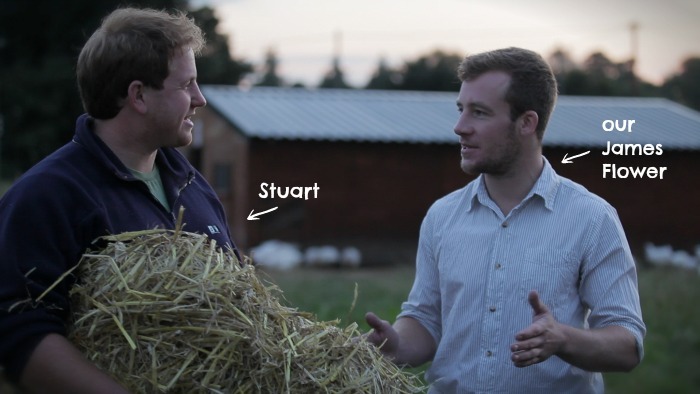 Stuart has been raising poultry since he was given twelve chickens as an unusual gift on his sixth birthday, and including a stint at agricultural college (where he met James and James), he has been building his brood ever since. We’re delighted that Stuart is raising our Christmas turkeys this year, as any of you who have tried our field&flower chicken will know the incredible quality of his Castlemead Farm birds. Hi Stuart, how long have you been farming turkeys? My father first started to produce turkeys when I was young. I can remember standing on a stall collecting the giblets and putting them back inside the bird, not everyone’s childhood memory! When I was around 14 I had my first flock of Christmas turkeys, just 16 of them which I hatched out in the incubator, and it’s all grown from there. What breed of turkey do you farm? All of our turkeys come from Kelly turkeys. We keep both white and bronze. We once had a customer to look around the farm who had to ask which ones were white and which were bronze…it’s fairly obvious! We find the bronze and white turkeys don’t like each other. After 8 weeks they have to be reared separately otherwise they will attack each other! Have you ever had any turkeys rustled? Not personally, although I have heard it happen. We have to be very careful around Christmas to ensure they’re secure. This often means someone sleeping on the farm to guard them. Do they require any special treatment? Turkeys are extremely fussy birds. They need a very warm and sterile environment as chicks but after 6/8 weeks they then need a very cool and airy environment, the complete opposite to what they need in the first few weeks. How old are your turkeys when they are killed? We keep our turkeys until 5 months of age (20 weeks). They are then mature birds. What’s the best thing about your turkeys? Has to be the taste! The birds are dry plucked and hung which gives them a fantastic succulent flavour. I’ll have to consult my mum on that one…I would say experience is important, although the most important thing is not to over cook the bird as this will begin to dry it out. Does your family eat one of your turkeys for Christmas? Naturally, they get it free! This entry was posted in Field and Flower and tagged Agriculture, christmas, field&flower, grass-fed, meat, meat delivery, Poultry, Somerset, turkey. Bookmark the permalink.